Winter 2018-2019 Wochen bereits gebucht! Auf einem breiten, weißen Sandstrand mit Blick auf die spektakulären Wasserfarbene Wasser des Cowpet Bay dieses luxuriöse Wohnanlage nur wenige Minuten von Red Hook zum Einkaufen oder zum Essen, oder mit der Fähre nach St. entfernt John und Tortola. Entspannen Sie in diesem zentral klimatisiert, mit zwei Schlafzimmern, zwei-Bad-Eigentumswohnung mit einer voll ausgestatteten Küche, Wohn- / Esszimmer, Waschmaschine / Trockner, Deckenventilatoren, zwei Fernseher, Videorecorder, DVD, Stereoanlage mit CD / Kassettenspieler, und Telefon. Alle Bettwäsche und Badetücher sind vorhanden. WLAN ist verfügbar. Jedes Schlafzimmer hat ein Kingsize-Bett. Über dem Wasser liegt, genießen Sie einen atemberaubenden Blick auf das Meer von der großen, privaten Terrasse neben dem Oceanside Schlafzimmer und ein Wohnzimmer. Ein zusätzliches Queen-Size-Ausziehcouch ermöglicht insgesamt sechs Gäste. Ideal für zwei Paare oder Familien. Schlendern Sie durch die wunderschöne Gartenanlage. Schwimmen Sie im kristallklaren blauen Wasser. Liegestühle am Strand und Segelboot, Kajak, Windsurfer, Schnorchel vorgesehen und Tretboot gemietet werden, zusammen mit einem Fitness-Center, eine Strandbar und Strand-Shop auf der nebenan Elysian Resort. Genießen Sie den herrlichen Speisen und Getränke in einem der zwei Strandrestaurants und Bars auf dem Gelände. Dieses Haus ist nur wenige Minuten von lässig und elegant Restaurants, darunter eines der Insel luxuriöseste im Ritz Carlton und das Nachtleben in Red Hook. Fünfzehn Minuten von Mahogany Run Golf. My family and I had a wonderful stay at Wally’s condo. The location is great, close to town and the ferry to St.John. There’s a nearby cove for swimming and a small beach. The condo has a nice layout and if you enjoy cooking, the kitchen is great for preparing family meals. Wally is also super helpful and attentive as a host. We enjoyed our stay and hope to visit again in the future! Thanks, Wally! My husband and I and our two children, 19 &16 had a fabulous time on our vacation! Wally's condo provided us with everything we need and then some! It was spacious and clean and the view is absolutely beautifu! The location is perfect as it is close to Red Hook where we took the ferry to St. John and dined at a few of the local spots. It is also close to Compass Point Marina and Sapphire Bay where we picked up our charter sails. We spent a day on the beach in Cowpet Bay which was relaxing and the restaurants at the Elysian are very convenient. The kitchen was well stocked and the cooler and snorkel equipment was and added bonus! Wally was wonderful to work with and checked in with us during our stay. We hope to return some day soon! Quiet and Private Complex, would go again! 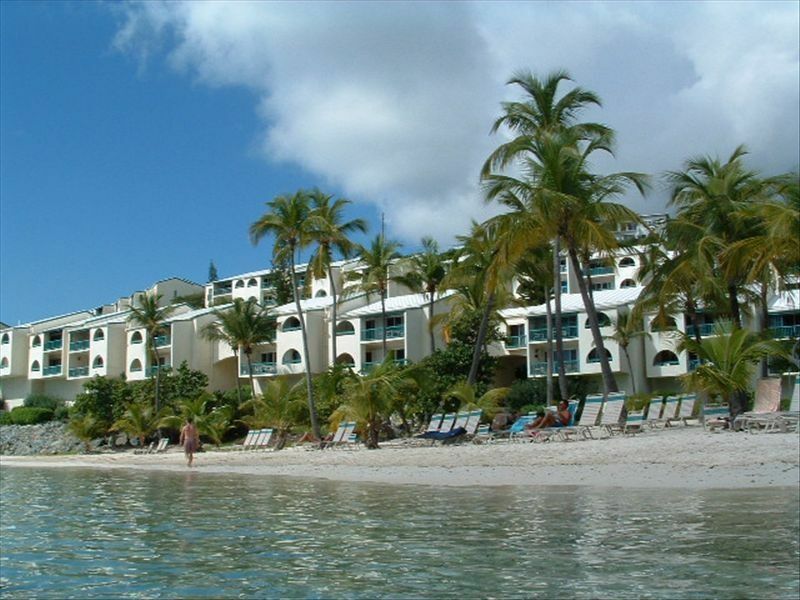 After a stay in St. John, we picked this VRBO for a 2 couple getaway in St. Thomas with king beds for each. This place has all you need for a great stay, whether getting out or staying in. Equipped kitchen, tv, separate baths, and beach access. Beautiful views! Owner is great to deal with and accommodating. Restaurants and ferry close by. Would definitely return. Condo is as advertised. Condo is nice and clean with an awesome view. There is plenty of room in the condo, theres a washer, dryer and a furnished kitchen. Close to ferry dock as well. We stayed here for a short time before going on a charter boat. Owner is easy to work with as well. We stayed in the winter, when our flight got delayed due to snow, we arrived a day late and i was refunded the first nights rent since I couldn't make it. That was very much appreciated! We will definitely be staying here again. Thanks for a great experience! So glad that you enjoyed the condo! Hopefully your next stay can be longer! We understand that sometimes the delays are out of our own controls, and didn't feel that you should "bear the brunt" of that---we felt it was only fair to refund that day since you never got to use it. We look forward to working with you again! No additional charge for cleaning fees.